Nigeria Queen of the tracks has further giving a warning signal to whoever wants to compete with her to lay claim to the title of the only queen of the tracks in Nigeria for now. Competing at the All Nigeria Athletic meet, she set another record of 11:02 second to claim the 100metres race at Delta State. The all untiring queen of the track seemed to be revitalized in her personal effort as she had increased her personal time record. For now the stage is set for her to compete at any international meet with fresh vigour and hope. What The Newswriter sports would advise the Nigeria National Sports Commission, Athletic Federation and the Federal Sports Ministry is that, Blessing Okagbare should be allowed to concentrate on her best event as proved by her personal time record. And not to cumbersome her with all other events which she might try. 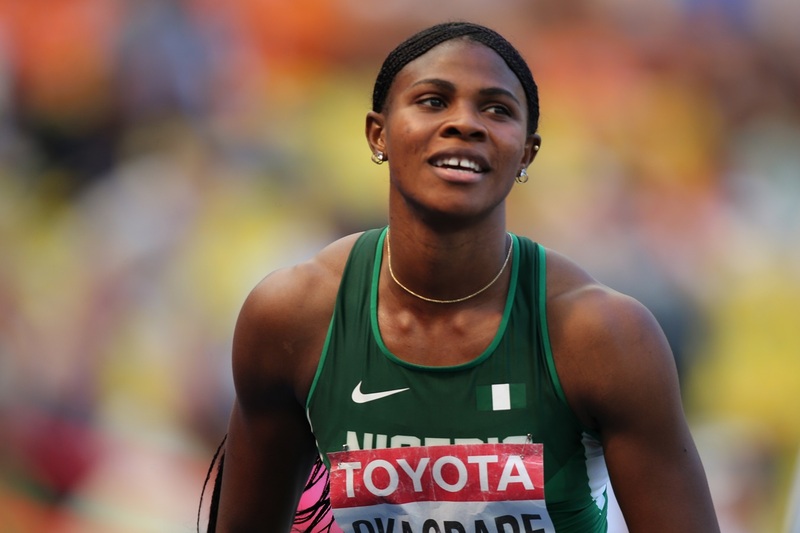 If Blessing Okagbare is allowed to concentrate only on the tracks like 100 metres, 200 metres, it would be better for her and Nigeria as medals is definitely hopeful at that end in the international stage. Let the authority concerned take note and do things right this time around. Let other athletes be discovered so that it will easy off the burden the Nigeria athletic federation is saddling on Blessing Okagbare, by allowing her to participate in so many events at the international meets. It is not too early to start discover another Blessing Okagbare at the grassroots particularly, in the secondary schools in all local government across the Nigeria federation. The earlier this is done the better for Nigeria for the future. Nigeria is blessed with many more Blessing Okagbare almost in the north and south, Middle West, East and central Nigeria. The only thing lacking why they are not discovered yet is because much attention is paid to football alone, leaving to discover other budding talents in other sporting events like swimming, wrestling, tracks, field and events in all sports. The Nigeria sports commissioner must be up and doing in this regard. Nigeria as a country has benefited long enough for the personal effort of Delta state over the years. This the federation sports authority can do much more to correct and put a workable athletic programmes in place, so that from year to year all states would be harvested of it ripened products (athletes). Name them, from football to other sporting events, Delta State had supplied to the Nigeria federation more than other states in Nigeria, this is a fact and indisputable. The same scenario is showing in the traditional sports of the country, where Nigeria has it strength. Mention wrestling, swimming and canoeing, the Bayelsa duo of Daniel Igali and Rtd Admiral Festus Porbeni are blazing the trail.